At Summerland Camps, we offer a high-quality service at a reasonable cost. There are no hidden fees with our camp. We are a program built by industry professionals who have managed similar programs which charge upwards of $500 to $800 per day- up to four times the cost of Summerland Camps while providing no aftercare services or ongoing support. We are proud to offer a more effective product at a significantly reduced cost than most comparable programs. Summerland Camps were built by industry leaders who know what works to create real change in adolescents and teens. Consider the cost of sending your child off to independence without the ability or desire to limit their screen use. Reuters reports only 46% of college students graduate, in part due to “not being prepared” or “inability to cope.” Researchers at the University of Chicago found that young men without college degrees have replaced 75% of the time they used to spend working with time on the computer, mostly playing video games. According to the Pew Research Center, for the first time since the 1930s, more U.S. men aged 18-34 are living with their parents than with romantic partners. The cost of doing nothing can be staggering. It’s important to understand that the value of Summerland Camps is more than just the camp experience. 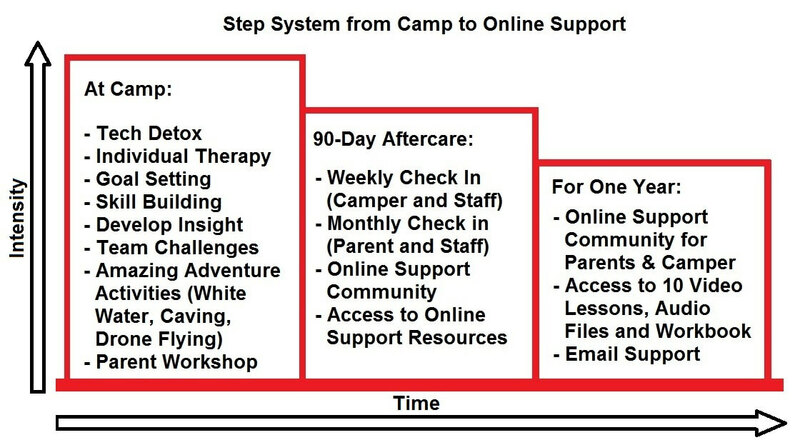 Campers participate in online remote aftercare services and also participate in a large online community with members in over 80 countries who are committed to quitting technology addictions. For the 90-days following camp, campers participate in an intensive online aftercare program where they check in with a counselor from camp weekly to track progress towards goals. Parents also check in with staff monthly during the 90-day intensive aftercare. Following the 90-day intensive aftercare, campers and parents can use our online community and resources for a year or longer after camp is over at no additional cost. If parents eat with their camper during the family workshop (optional), they will need to pay for their meal own at the University dining hall. Rates vary but are around $6-$10 per meal. When comparing our pricing structure to other programs, it’s important to remember that we do not charge a separate enrollment or equipment fee. All of our costs are rolled into the tuition price. This also includes the Family Workshop. We want all parents to attend the Family Workshop, so we don’t charge extra for this service. We do offer online remote aftercare as an additional service beyond 90-days. You can purchase aftercare by the month or prepay for the entire year.